Ideal for home use, college dorms, traveling...wherever the music takes you. 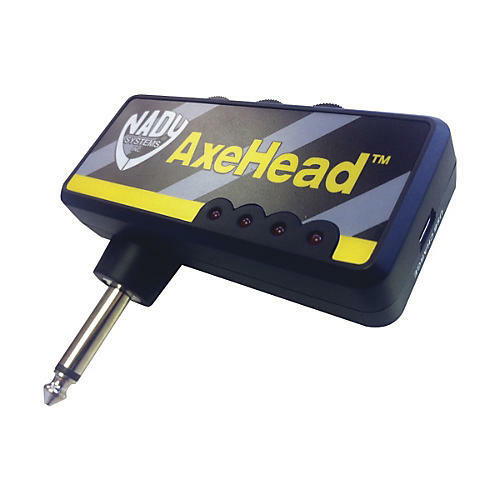 The Axehead Mini Headphone Guitar Amp plugs directly into your guitar or bass for instant pro sounding audio¦anytime, anywhere. It's the perfect practice tool---listen though our headphone, crank it up without disturbing anyone around you! No need for your bulky amp. It features built-in amp simulation-tailor your tone, from ultra clean to heavy distortion. Up to 15 hours play time with convenient built-in Li-ion rechargeable battery-no need to change batteries. To recharge, connect supplied USB cable to computer's USB port or optional AC adapter (note: only for recharging AxeHead, not for computer recording). Plug in and play. Order today.